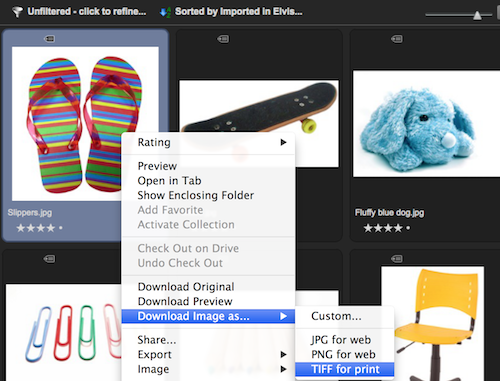 Using the Elvis Desktop client, it is possible to download a range of selected files or download a complete folder structure. You can download the original file in its original format or you can download the preview as used by the Elvis clients. Previews are downloaded in a specific file format for each kind of file (see the supported file types). For images, custom download options are available. You can access all download options from the application menu and the context menu on selected files. There is also a button to download the selected original files. Images can be downloaded in various ways. 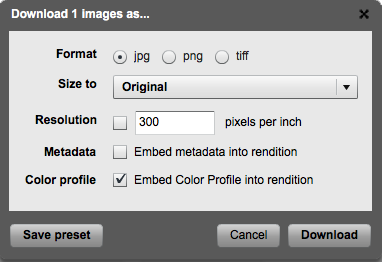 Right-click a file and choose Download Image As... > Custom... and choose one of the following options. Size to. Download the image in its original size or as a percentage of that size. Resolution. Specify the resolution in which to download the image. Color profile. (Requires Elvis 5.24 or higher) Define if the color profile that was used to generate the preview should be included. Options that are used often can be saved as Download Presets and optionally shared with others. Users can create their own Download Presets or they can be created by the system administrator. Note: Download Presets can only be shared with user groups, not with users. Step 1. In the Download window, click Save Preset. The New Preset window appears. Step 2. Enter a descriptive name for the Download Preset. Step 3. (Optional) Select one or more groups to share the Download Preset with. 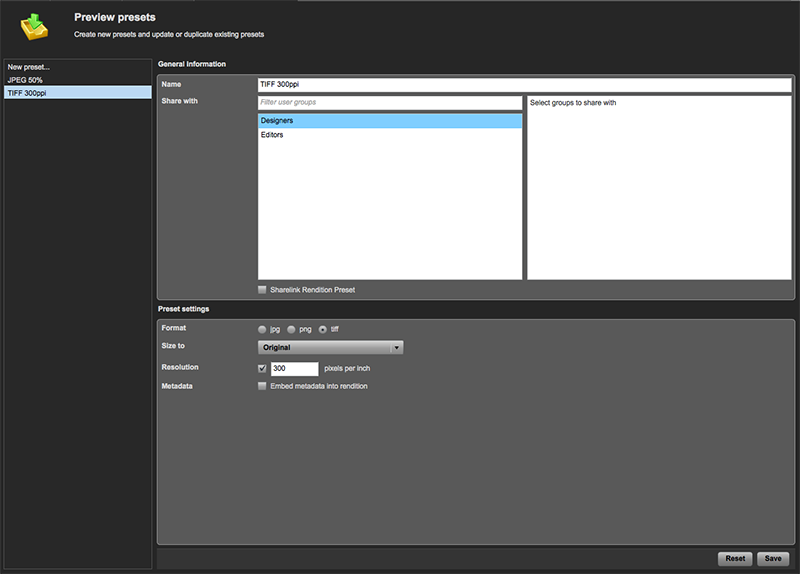 Note: The options for sharing Download Presets only appear when user groups exist within Elvis. Step 1. In the Desktop client, choose Organize > Organize Download Presets. The Preview presets window appears. Step 4. Define the download settings for this preset. 30 June 2017: Made the instructions about how to share Download Presets clearer. 3 May 2017: Added information about the option for including the color profile of an image.